Those who went to the New Museum Triennial last year might still remember a juxtaposition of an iPad on a pedestal with a worker’s uniform, ID card, and contract on a white gallery wall. The objects in the installation belong to Li Liao, a performance and video artist based in Shenzhen, China, who applied to become a worker in a Shenzhen factory which assembles tablets for Apple. Li’s job was to inspect circuit boards for iPads for 10 hours a day. After forty-five days, he earned enough money to buy an iPad and quit the job. Titled Consumption (2012), the documentation of this factory experience became Li’s best known piece. Through a seemingly peaceful participation in daily lives in a factory, the artist addresses the alienation of the consumer products and their producers in an intriguing way. “I will never go back to the factory to work,” Li said in an interview with The New Yorker. While documentation of his factory experience drew attention to a larger socio-economic context, Li’s new work Attacking the Boxer from Behind is Forbidden (2015) brings viewers a more personal reflection about the relationship between physical and psychological space. Currently on view at Klein Sun Gallery as part of Li Liao’s solo show, the work is composed of a hired professional boxer wandering in a figurative boxing ring in the gallery space created by heavy duty industrial tape lining on the floor during open hours. When people enter the gallery, they probably do not expect an encounter with an active boxer, whose gazes and energetic postures suggest an invitation to fight. “My point is about the tension created by the distance between the boxer and the viewer…that subtle balance before the exact moment of a real confrontation.” Li made a lot of effort communicating with the boxer to make sure that he took this job seriously, and the process was not easy. Due to a language barrier, Li Liao’s thoughts about this unique work were first communicated to a Chinese curator who is fluent in French and then to the French-speaking boxer. The work itself is slightly altered by the boxer’s own interpretation, but together they challenge the stereotype of a deadly quiet gallery space in Chelsea. Accompanying the live work are a photo documentation of a performance piece and two video installations that recount earlier projects. 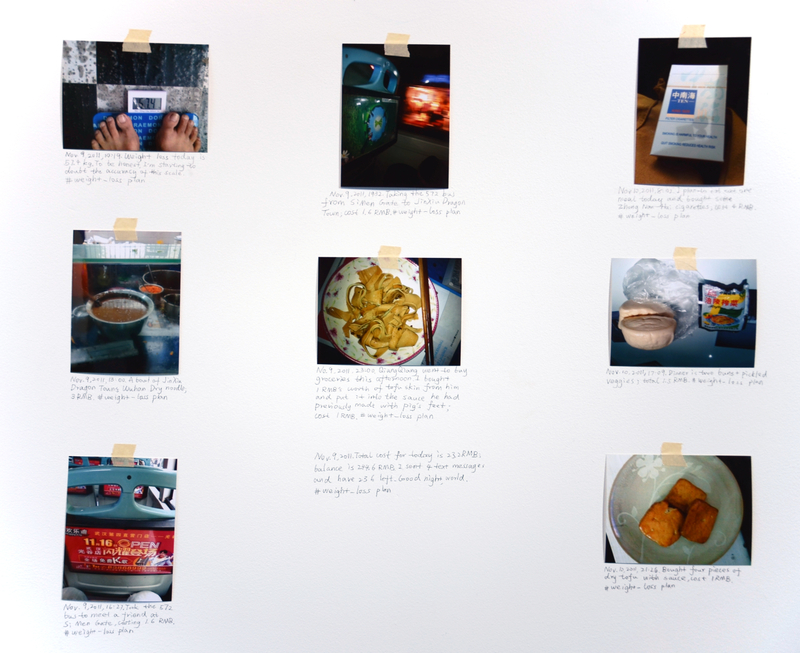 In Weight Loss Plan (2011), roughly one hundred photographs are spread chronologically over two gallery walls, depicting the daily life when Li Liao survived on 350 Chinese Yuan (about $53) for a month in Wuhan — the same amount he spent ten years ago when he was a student at Hubei Academy of Fine Arts. “I frequented a university cafeteria for cheap meals, and there was a female staff worker who had so much sympathy for me that she put more food in my plate!” Li recollects with amusement. Other video works featured in the show were all conceived and carried out in Wuhan, the capital city of Hubei Province where Li Liao studied and lived in for a long time. A Slap in Wuhan (2010) features the artist standing still in a busy shopping district in Optics Valley, a famous high-tech industry center in the city, with his eyes closed, waiting for a stranger hired through online forum to slap him in the face. 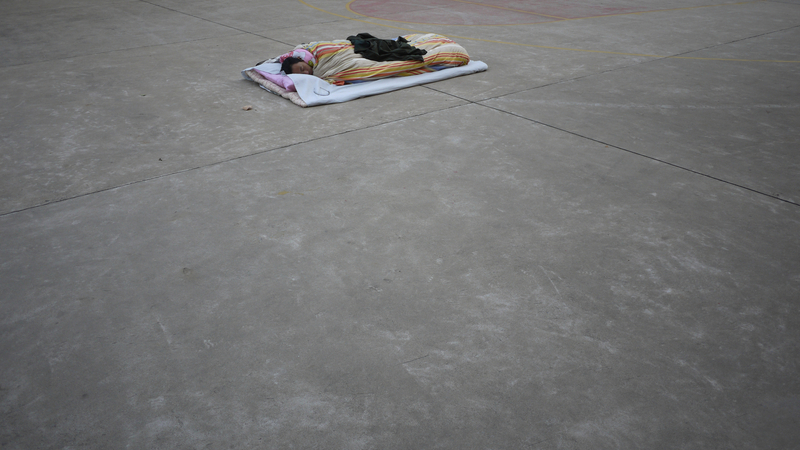 For Single Bed (2011), the artist stayed up for two days before going out to public places in Wuhan to lay down and fall asleep on the ground. Sometimes, he drew so much attention from puzzled crowds that he had to be woken up by the police; while at other times, he could remain undisturbed for hours. While the older generation of Chinese artists still mourn the wounds of the Cultural Revolution, Li, who was born in the early 80s, turns his attention away from political criticism in most of his works. Inspired by things and people around him, Li’s creations have always followed his philosophy of discovering the extraordinary in ordinary life. From a box of cheap cigarette to a pillow and a blanket on the ground, Li Liao‘s documentation touches upon his genuine concern about human condition. Through this artist’s relentless practice, the simple routines of eating, buying, sleeping, and waiting are given new connotations. 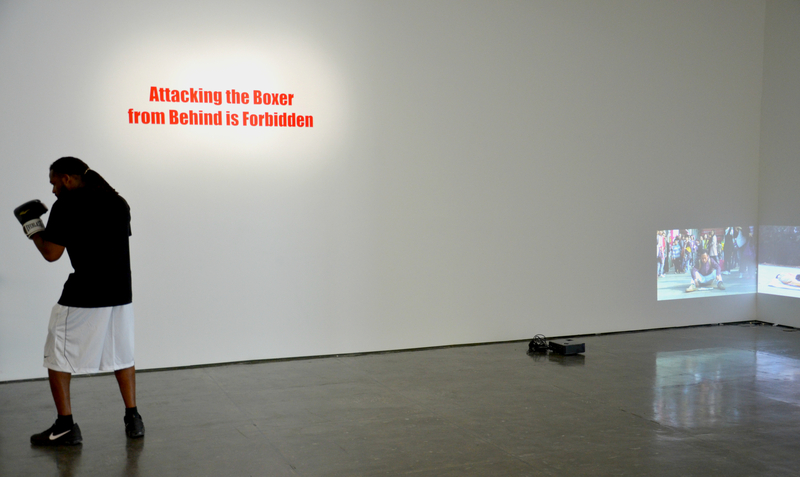 Attacking the Boxer from Behind is Forbidden continues at Klein Sun Gallery until November 14, 2015.